BRCA2 is a gene that produces tumor suppressor proteins. It helps to ensure and maintain the overall health and productivity of the cell. When BRCA2 is mutated, it negatively effects the gene's ability﻿ to create protein﻿s which repair cellular processes, allowing the cells to become more susceptible to cancer. Genes containing mutated BRCA2 have been linked to the onset of breast, ovarian cancer,prostate, pancreatic, fallopian tube, and male breast cancers, as well as melanoma (1). When compared women without the defective BRCA2, women with defective BRCA2 have a 33% more likely to develop breast cancer by the time that they reach 70, at a rate of 45%(2). In regards to ovarian cancer, the risk factor jumps from a 1.4% chance of developing ovarian cancer to 11-17 (2). The BRCA2 gene is closely related to the BRCA1 gene in terms of location and cancer diagnosis. Also in terms of function, both serve to produce tumor suppressor proteins, therefore mutations in either one potentially can result in high risk for breast and ovarian cancer. Other cancers that can be derived for women from specific mutations on either the BRCA2 or BRCA1 gene also are at high risk for fallopian tube cancer and paritoneal cancer. For men, they can have a high risk of acquiring prostate and pancreatic cancer. What chromosome is the gene on? What is the cytogenetic location? 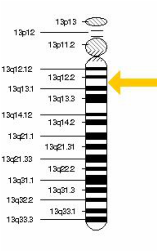 The BRCA2 gene is located on chromosome 13q12-q13 which is is associated with breast tumor growth and poor prognosis. The BRCA2 gene is transcribed in a diverse range of tissues especially the testis, ovary, and midgestation embryo. Interestingly, BRCA2 can be also expressed in the mammary gland to induce pregnancy as well. 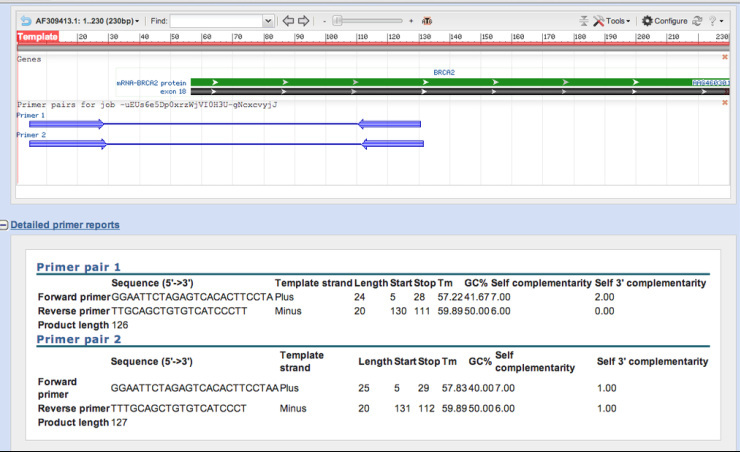 For the BRCA2 gene, we used the first primer sequence whose nucleotide sequences for both directions is listed in the picture. Also, information about the primer such as product length, GC%, and template length is also located inside the chart. BRAC2 itself is a gene. The actual protein codes for 3418 amino acids. These amino acids help to repair damaged DNA and work as tumor suppressors, as well as over looking homologous recombination. This protein interacts with the proteins of other genes such as RAD51 and PALB2 to fix broken DNA. How was the gene discovered and located on the chromosome? The BRCA2 gene was discovered in 1994 by Professor Michael Stratton and Dr. Richard Wooster from the Institute of Cancer Research, UK. To isolate the gene, both scientists also collaborated with the Welcome Trust Sanger Institute who eventually celebrated this discovery by constructing a cycle and footpath in honor of the gene in 2005. This footpath which is located in between Addenbrooke's Hospital and Great Shelford. What do we know about about when/where the gene is expressed? The BRCA2 gene is transcribed in a diverse range of tissues especially the testis, ovary, and midgestation embryo. Interestingly, BRCA2 can be also expressed in the mammary gland to induce pregnancy as well.